"Slowly making progress, I spent a good part of today at the mouth of the San Bernard River with State Representative Dennis Bonnen, Commissioner “Dude” Payne, Port Commissioner Shane Pirtle, Constable David Thacker, representatives from the GLO, TPWD, USFWS assessing the after Harvey changes in the reopening of the mouth of the San Bernard river RESTORE project. We are creeping a little closer to making this project a reality. Big thanks to our airboat captains Mr. Pirtle, John Blankenship and Tim Morrison for returning us dry to the ramp. 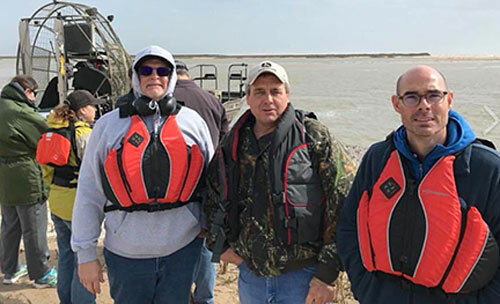 Check out Commissioner Payne’s cold weather airboat attire." "One of Brazoria County’s top priorities is reopening the mouth of the San Bernard River. I have worked with many dedicated citizens and local elected officials towards this endeavor over the years, with our most significant victory being the state and federal approval of RESTORE funding (Deepwater Horizon oil spill funds) to make this project a reality. Hurricane Harvey’s destruction has since changed the scope of the reopening project. Today I joined Commissioner Payne, Commissioner Linder, and project leaders from the GLO, TPWD, USFWS, and USACE to review the revisions of this undertaking so we can continue moving forward. (LIKE to support Commissioner Payne’s sense of cold-weather fashion)."